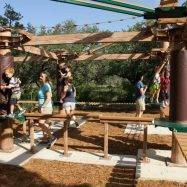 The Sky Tykes junior ropes course is manufactured specifically for children and just like our larger Sky Trail high ropes courses, harnessed participants will hook into the patented safety systems and begin their adventure. 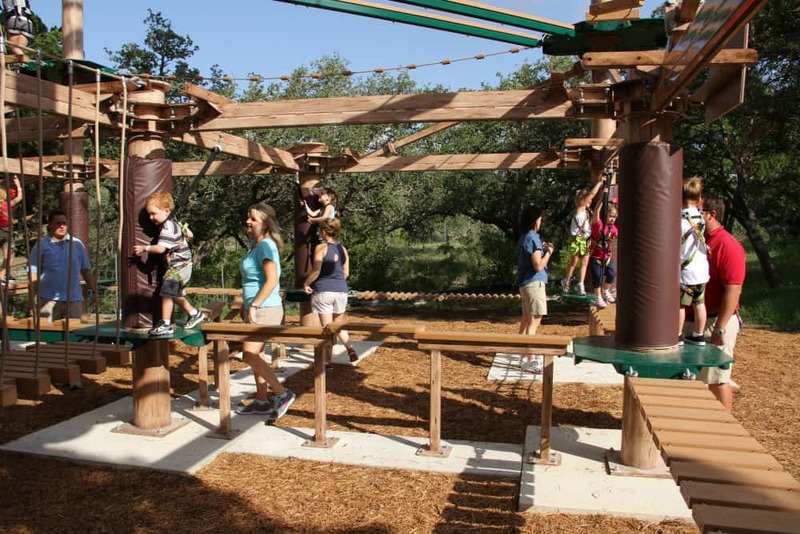 When combined with a Sky Trail course, the addition of Sky Tykes creates a high ropes experience the whole family can enjoy together from the very young children right up to the parents. 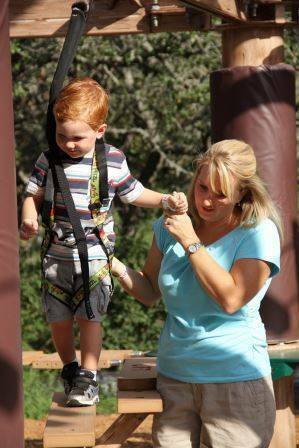 Sky Tykes are designed for children below 1.2 metres in height, typically between the ages of two and seven. 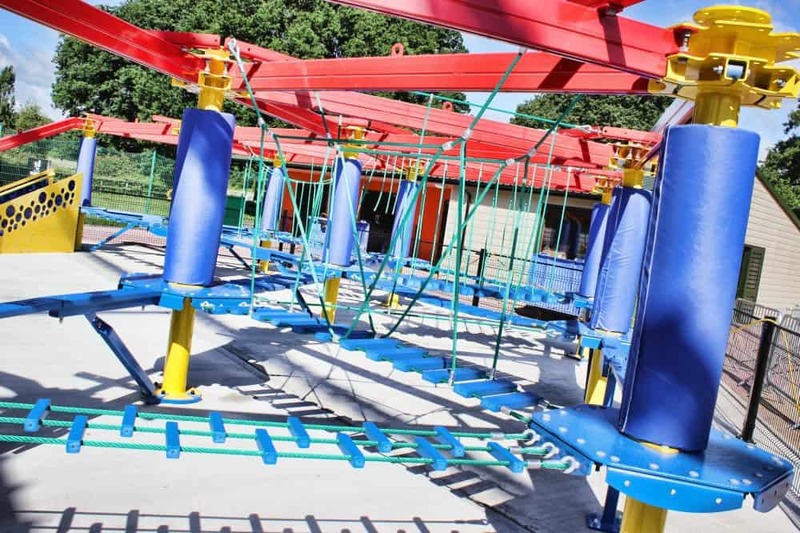 A unique feature of Sky Tykes is the walkthrough element area. 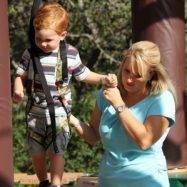 This special feature allows for a helper, usually a parent, to accompany their child while they negotiate the many challenging rope elements the course offers. 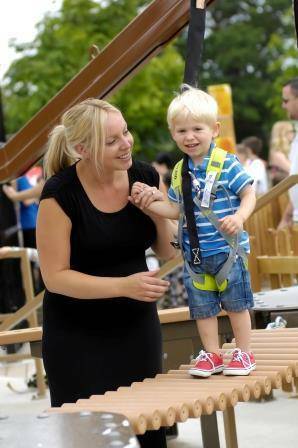 Parents walk alongside their child and are able to assist with any help they may need. 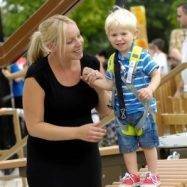 The Sky Tykes course is suitable for indoor and outdoor locations in a whole range of different sectors. As well being combined with a Sky Trail course, Sky Tykes can be installed as a separate entity. 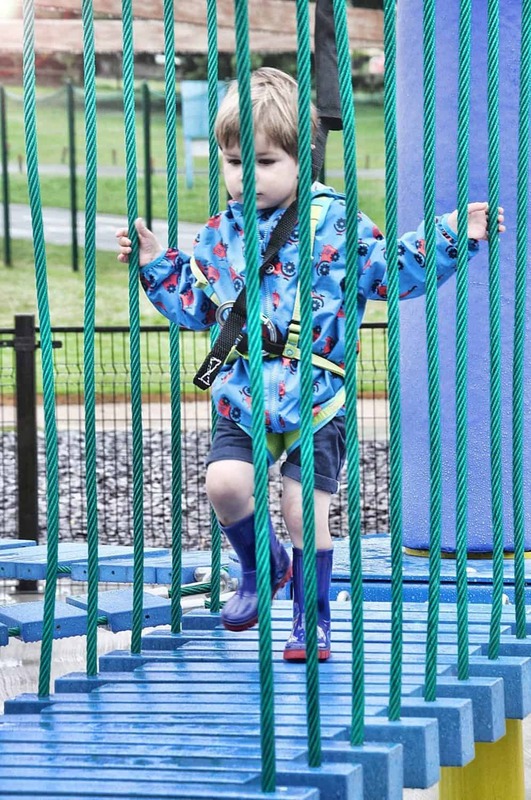 Some example layouts are given on this page but when installed alone, Sky Tykes can be designed to fit specific areas and can utilise previously wasted space. These are the two Sky Tykes specifications for standard course sizes, however, certain layouts may offer more elements than listed and therefore a higher capacity. 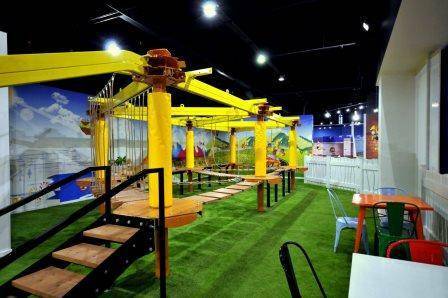 Sky Tykes are proving popular with the indoor play sector as an additional adventure play attraction. 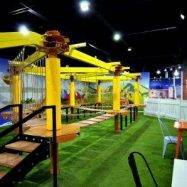 It fits in perfectly with the target age range of this sector and offers a unique experience for younger visitors. Some indoor play centres have opted for a Sky Trail high ropes system which expands a centre’s target age range and moves them into the Family Entertainment Centre bracket. 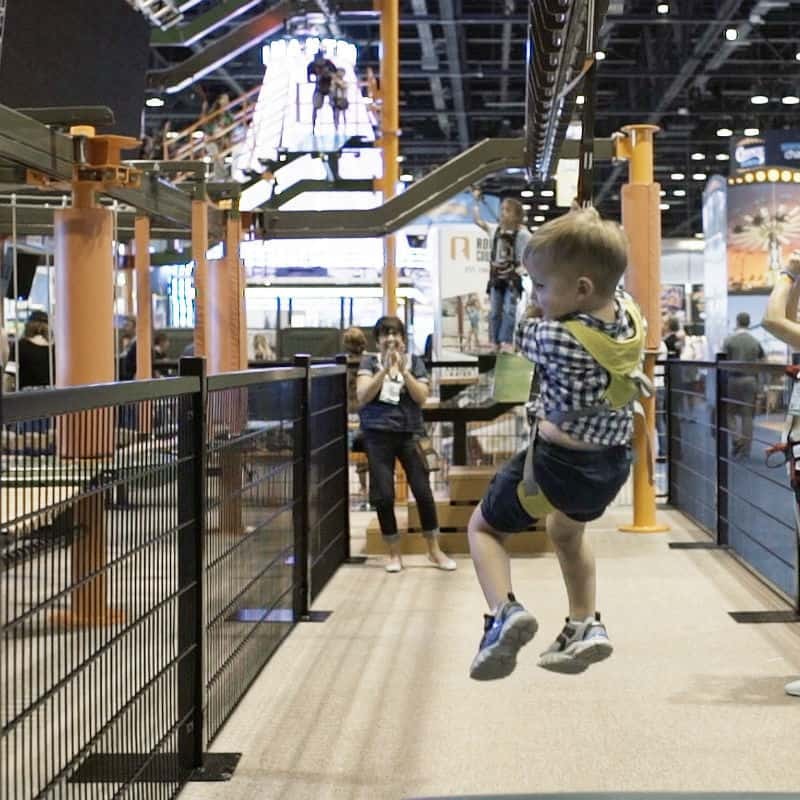 Combining the Sky Trail ropes course with Sky Tykes enables indoor play centres and FEC’s to offer a high ropes experience the whole family can enjoy. 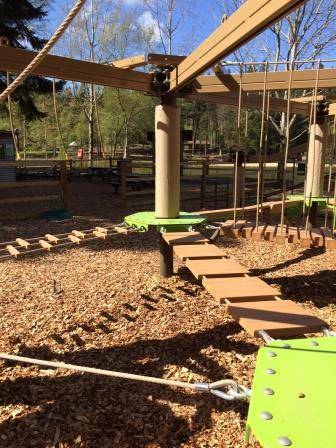 Examples in the UK of Sky Tykes installed on their own are Centre Parcs Longleat, Sherwood and Landmark Forest Inverness, Action Stations in Portsmouth and Fun Shack in Stockton-on-Tees. 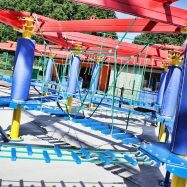 All Sky Tykes ropes courses are installed by highly trained Innovative Leisure staff and are supplied with a design review, risk assessment, individual operators manuals and training session for your staff included. 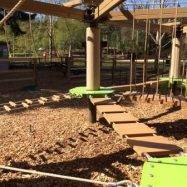 In the UK each Sky Trail high ropes course is also fully ADIPS tested and comes with a document of compliance supplied as standard. 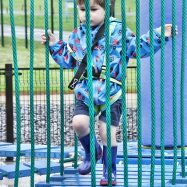 If you don’t think the Sky Tykes course is the right high ropes for you then take a look at our other Sky Trail options.